Photo by Tom Rivers: Patrick Whipple presents data to the Lyndonville Board of Education on Monday which he said shows at least 19 Lyndonville boys want to play varsity soccer for Lyndonville. Those boys are currently in grades 9 to 11, and would be sophomores, juniors or seniors next fall. Photo by Cheryl Wertman: Nate Dillenbeck, a Lyndonville student who plays on the combined Medina/Lyndonville team, is shown on Oct. 1 during a game at Lyndonville when Dillenbeck scored 4 goals against Global Concepts. Typically, the Medina/Lyndonville team plays its home games at Medina and wears Medina uniforms. 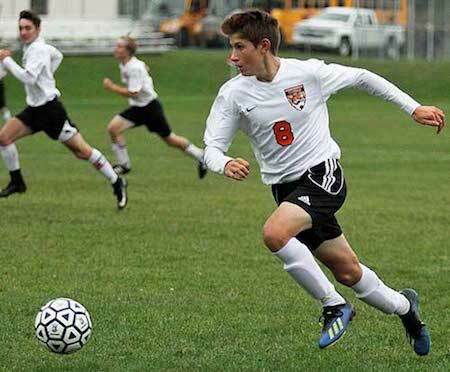 LYNDONVILLE – The Lyndonville Board of Education was asked to bring back its own varsity boys soccer team on Monday, instead of being part of a shared team with Medina. The two schools have played as a joint team for six seasons, starting in the fall of 2013. Both schools at the time would have struggled to field their own team. 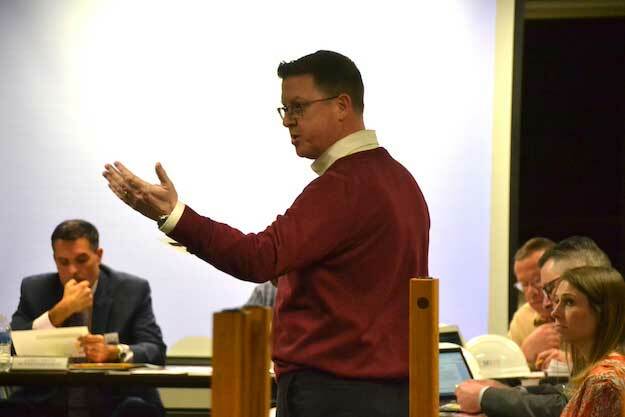 But now both schools have enough players to field competitive teams on their own, according to two parents who spoke at Monday’s Board of Education meeting. Lyndonville and Medina both had strong JV teams this fall, and should be in good shape for players on the varsity level for at least the next two to three seasons, some of the Lyndonville parents said. Lyndonville is discussing its shared sports with Medina. The board hasn’t made a decision about next school year. Penny Barry, parent of Lyndonville soccer player, said the “overwhelmingly consensus” of the JV soccer players and their parents is not to continue with the merger next school year. Lyndonville has at least 19 players who would like to play on a Lyndonville-only team. Lyndonville boys are part of teams based in Medina for football and soccer in the fall. The schools also have a combined volleyball team in the fall. The football and soccer players wear the Medina Mustang uniforms, except for two home soccer games at Lyndonville. Patrick Whipple, another soccer parent, presented data to the board that showed at least 19 Lyndonville boys, currently in grades 9 to 11, played soccer this fall. There are 11 players on the field at a time, and teams need to have several substitutes. Other parents who spoke to Orleans Hub said a Lyndonville-only team would help build school spirit. Right now there are only a few games for Lyndonville boy athletes to play in front of the home crowd in the fall. Ted Lewis, the BOE president, said the board expects to make a decision next month on 2-year agreements with Medina for sharing different sports programs, as well as the musical which is based in Lyndonville, and the marching band which is based in Medina. Lewis said the partnership with Medina has been positive for both districts by maintaining opportunities for students. In some cases, it has created new opportunities. Neither school had a volleyball team until that was added. The board welcomes feedback from the community about the issue. The district website (click here) has a “Let’s Talk” feature where the community, including current and former Lyndonville athletes, can share an opinion about the merged sports.